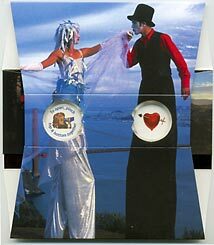 As stiltwalkers Monica Tse and Temple Brady stroll along the Marin Headlands, Temple makes the romantic gesture the French call le baise-main (the hand-kiss). In the background the Golden Gate Bridge seems to unite them like a giant version of Cupid's arrow. As with many Oh Wow! cards, other pictures of Monica and Temple adorn the side panels. This could be sent as a Valentine's Day gift, as a wedding gift, or in response to any romantic impulse. Love Makes You Feel Ten Feet Tall!